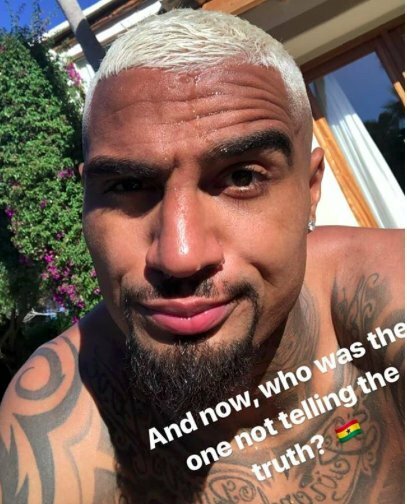 Ghanaian footballer, Kevin Prince Boateng made an Instagram post. Furthermore, this post followed the showing of Anas’ new documentary. Moreover, in the post he wrote, “and now who was the one telling the truth”. He made the post in blonde-hair. Black Stars sensation, Kevin-Prince Boateng (KPB), feels vindicated following exposé of the rot at the Ghana Football Association. Also, he took took to Twitter to comment on the shameful revelations of the undercover sting on the GFA and key officials. Furthermore, the post implies the circumstances that led to his dismissal from the 2014 World Cup camp were unfair. KP and his outspoken colleague, Sulley Muntari, were sacked from Black Stars camp during Brazil World Cup tourney in 2014. Furthermore, this was over alleged insubordination towards coach, Kwesi Appiah. However, he is in retirement. Later, he revealed that the allegations were false. He stated that he was sacked for questioning the GFA president, Kwesi Nyantakyi about the whereabouts of FIFA’s $ 1million given to finalists to prepare for the tournament.